A Persian expression “Nafas az Jay-e garm” literally translates “Breath from a warm locale” in English and often used to describe where one is distanced from the reality because of his/her financial and/or political standpoint. In most cases these individuals do not encounter the common day-to-day experiences of a society simply because they have lived overseas. Often this expression has been used as an irony. Dehkhoda writes in “Amsal o Hekam”, his encyclopedia of Iranian Proverbs: it can be pretty much unrealistic to accept an individual’s opinion that takes his/her breath in a warm locale. Warm locale here refers to a comfortable place. We borrowed the expression to address a situation where artworks with no references to exotic elements, political issues, and etc. 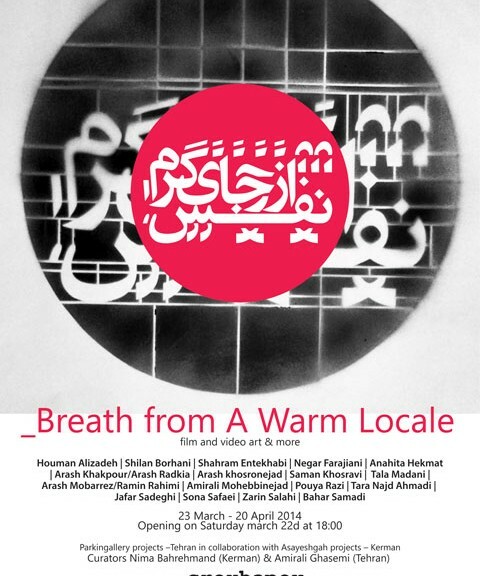 – are less likely to be selected for exhibitions of contemporary Iran. Despite their qualities and significance, they have been constantly filtered out and undermined for not being newsworthy or direct enough to be consumed together with an ideal news hour spent over dinner. With this expression we also refer to EU decision-makers in politics – specifically in relation to Iran – as spectators who “breath from a warm locale”.